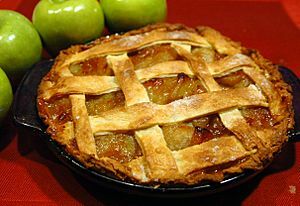 An apple pie is a pie or tart filled with apples. Sometimes it has whipped cream or ice cream on top. It is a common type of pie. It is commonly associated with American culture, e.g. the expression 'As American as apple pie'. Apple pie Facts for Kids. Kiddle Encyclopedia.